Exercise not only helps tone your figure, it also improves your complexion. Let us learn how exercise may be one of the best remedies for acne, wrinkles, dull skin, and other dermatological issues. Instant Glow: Aerobic exercises improve blood circulation and your skin gets a good dose of oxygenated blood. It gives great post-workout skin glow. Wrinkle Reduction: Working out helps to maintain healthy levels of the stress-related hormone- cortisol. High cortisol is linked to more acne breakout, collagen breakdown, and increased chances of skin wrinkling and sagging. 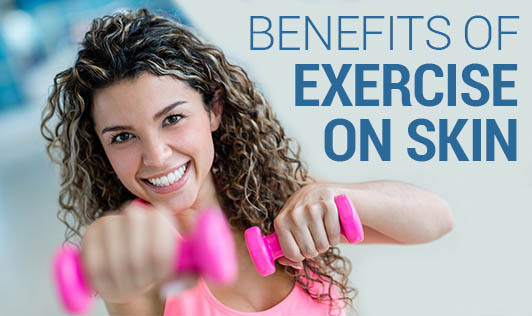 Exercise helps in the production of collagen which ultimately helps to keep the skin firm. Acne Relief: Regular exercise promotes blood circulation. It nourishes the skin, and brings more blood flow and oxygen. This will help remove toxins from the body. Sweating cleans out the pores on the skin. Healthier Scalp & Hair: Increased blood flow to the scalp keeps hair healthier and stronger. The blood delivers nutrients that stimulate hair follicles and promote growth. Exercise is a big stress reliever and lower stress means lesser hair fall. Every workout will improve circulation and reduce stress, but it’s wise to mix up your workouts as often as possible. Try adding 30 minutes of a few simple yoga postures or a brisk walk to your day, at least three times a week to achieve best results for skin and hair.